NextJS is an amazing framework that provides a great environment for React applications. Zero setup, server side rendering by default. Have you tried adding SSR to React projects? I have, it's not fun. I love that you can pick it up, and get going in minutes. The examples folder has a starter project for probably anything you ever want to start with. 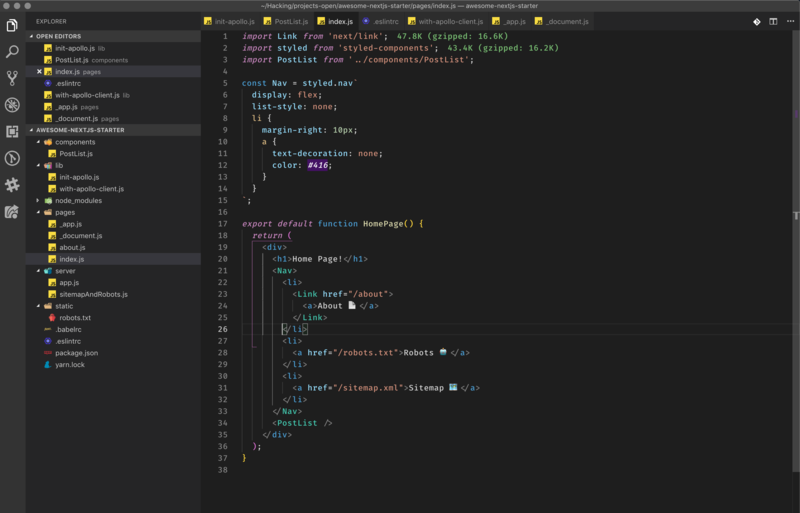 Custom express server, Redux, TypeScript, you name it. Check it out, if someonething you're thinking about isn't there, chances are they will add it soon, because that folder gets updated on a weekly basis. However, a lot of the times, you'll need more than one of those technologies to get going. So, I find myself bouncing between example folders and taking little bits from here and there. The initial setup time isn't THAT much building a single applicaiton, but when you do it over and over again, it accumulates. ESLint - I want my code to look good and save on edit by default. These are some basics that I find myself always going for so having a starter that has all of them preconfigured will save me A TON of time in the future. And hopefully, you find some value in this as well. We're going to start with initializing an empty folder and installing all the dependencies to get NextJS running. I don't care if you use NPM or Yarn and I am not going to argue with you on this one, but for the sake of not duplicating every command coming up, I am going to stick with Yarn. I am sure you'll be able to figure out the NPM commands on your own. Go through the process of creating a package.json file. Now we'll install the dependencies to get NextJS going. Now we just need to scaffold a few additional folders to make sure NextJS runs when we need it to. The pages folder is where NextJS builds its routes from by default. We'll revisit this later, when we're setting up express, but for now this is a good starting point. Now we'll open up the folder in our favourite text editor. 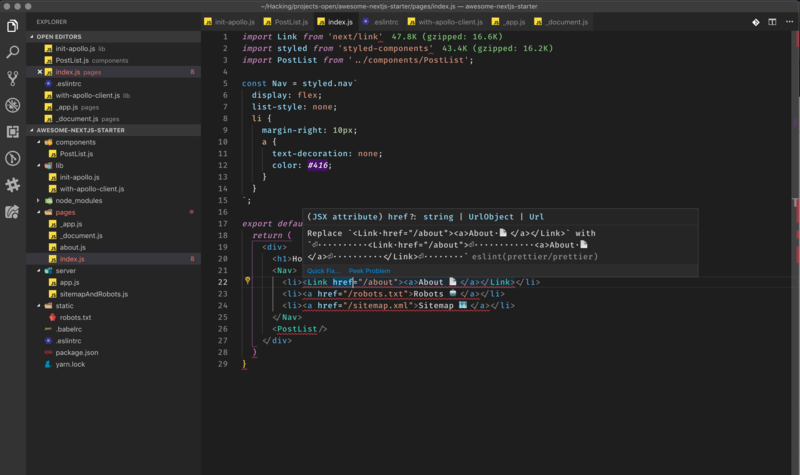 I've been using VS Code for a while now, it's a game changer. We'll modify package.json to add the NextJS scripts. And now let's go into the index.js file inside pages folder and set up our homepage. With NextJS applications you don't need to import React, it just knows you'll be using it so it gives it to you by default, magic! 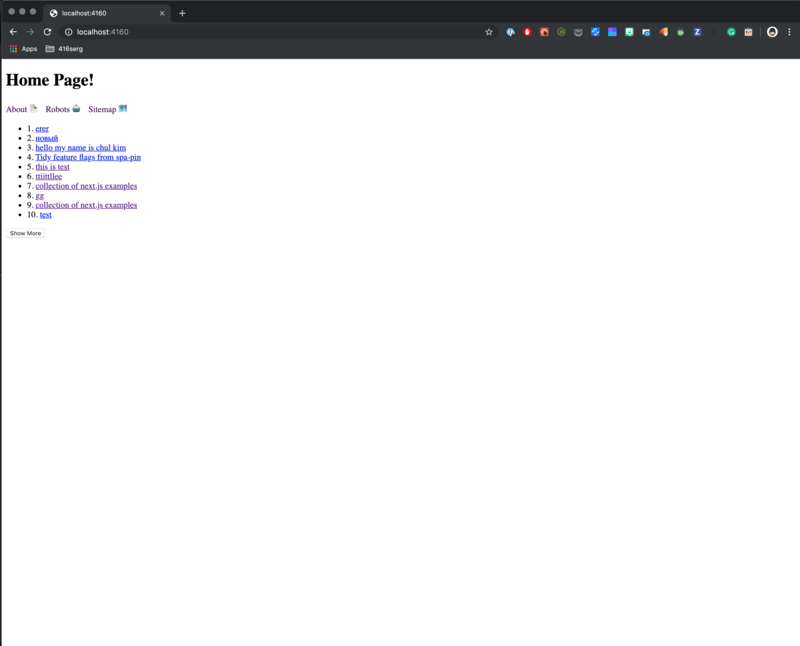 It should spin up the server at http://localhost:3000 so we'll go check it out in the browser. Voila, how easy was that! By default, NextJS routing only works with pages and query strings. So suppose you're building a store front for your awesome sneakers. You'll have a /shop page to display all your items and you want to have a /shop/yeezy-500 to display an individual product. Well, without Express, the best thing NextJS can do is /shop?title=yeezy-500 which isn't ideal for SEO or, just aesthetically in general. 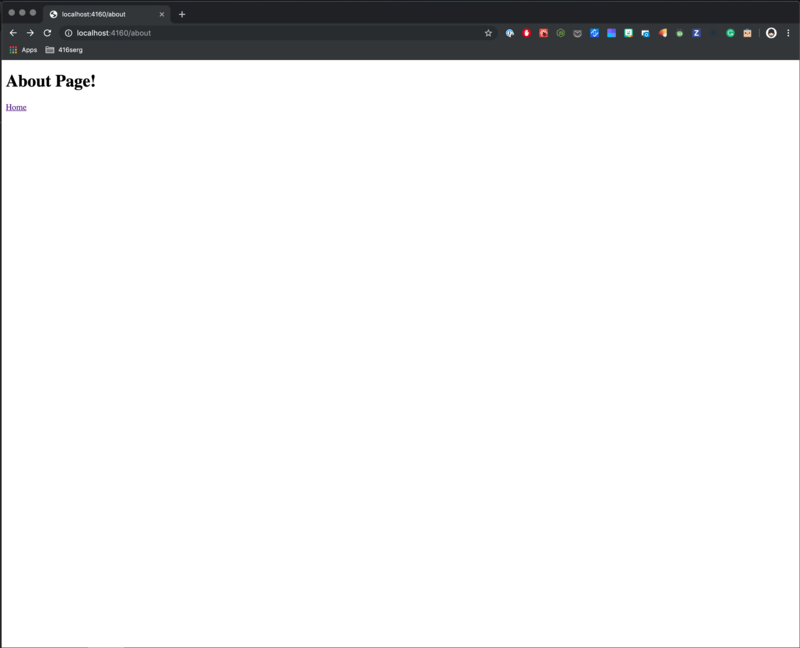 So we're going to install an Express server where we can manage how the server interprets URLs, as well as create custom responses for stuff like robots.txt and sitemap.xml cause it's 2019, and SEO still matters. So let's head over to the terminal and get it going. Let's try running it again. 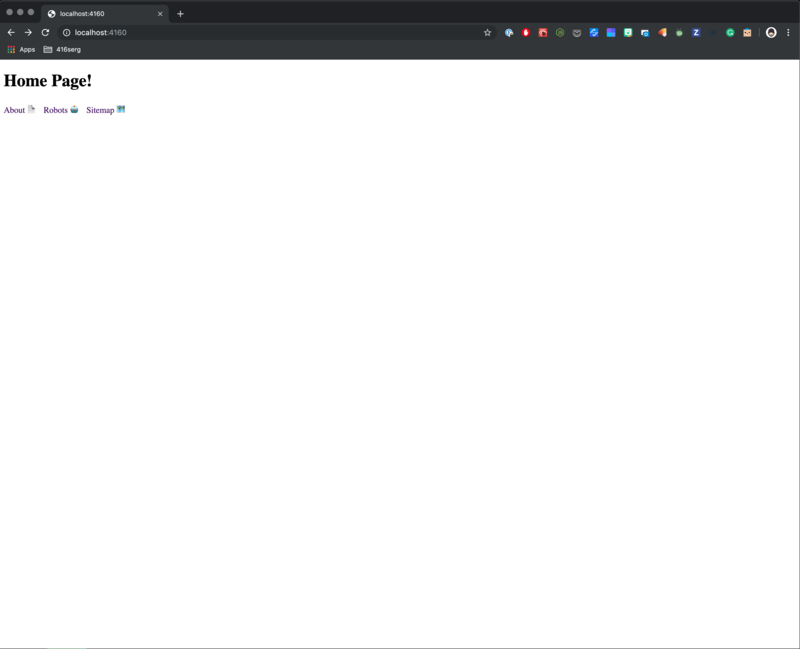 Run yarn start in your terminal and now if you go to http://localhost:4160 you should see the exact same page show up. Note, the port is specified in server/app.js on line 6. 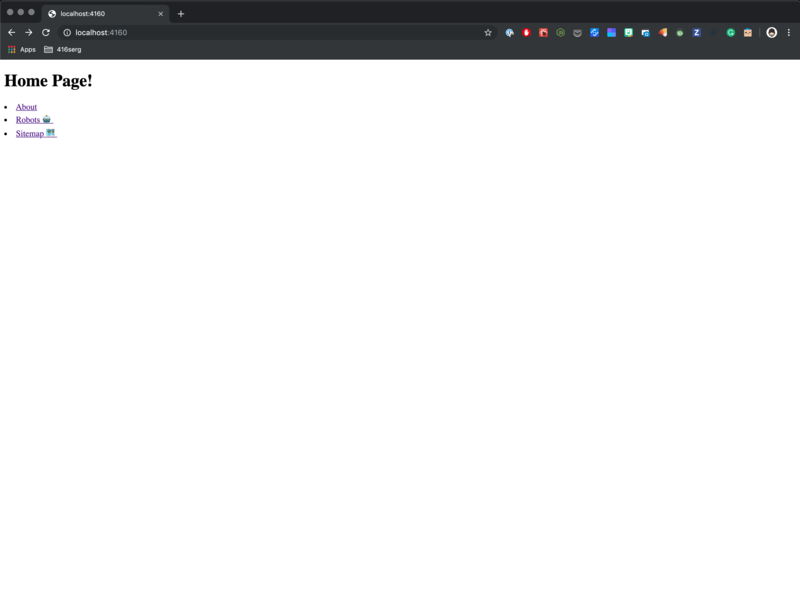 If you're building sites that rely on SEO, it's a good idea to add robots.txt and sitemap.xml for our good friends Google Crawlbot and the DuckDuckGo QuackBot (I don't know about that one, I just made it up). NextJS treats anything in the static folder as a static resource. This is where your icons, images, fonts would probably go. #         .-| : .----------------. : |-. #       ,\ || | |\______________/| | || /. #          that all bots are created equal." I wish I remembered where I found that robot before, but whoever made that to let me copy that, thank you. Next, we'll head back to server/app.js and configure our sitemap. Now that we have that, you'll see that I added an /about page to the sitemap. There is no reason why we shouldn't add that page to /pages/ folder. I'm introducing a new component here, Link which is how NextJS handles route navigation. 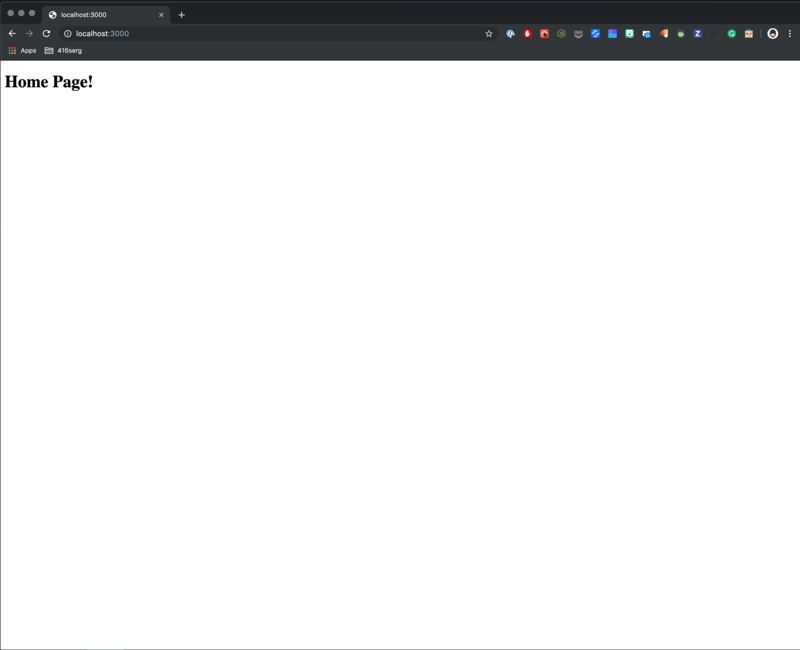 Now that we have that, let's link the homepage to the about page and add the links to robots.txt and sitemap.xml to the homepage as well so we know it's working. Now that we have a few elements on the page, it's a good time to clean them up a little bit. I am not a designer, and this isn't a post about styling components, but we'll get set up so that we can use them in the future. Most applications rely on data being passed in from somewhere. For me, it recently has been tapping into a GraphQL backend. Here we'll create a simple configuration and pull some data in from a GraphQL endpoint. Open up the new files in your text editor and here's what they should look like. Now it's time to make sure our app still works as expect, so let's start things up by yarn start in your terminal. Everything should work as expected. Lets create a simple component which will fetch some data from the GraphQL endpoint we have. We'll create a file PostList.js inside our components folder which has been empty up to this point. Woohoo, we've got some external data coming in! Up to this point, we've been writing our code, but we had nothing in place to make sure we write great code. From syntax fixes, to making sure you are prop checking your components, ESLint and Prettier will help us make sure our code is 💯. Usually, the config is pretty tedious and annoying, thankfully, Wes Bos created an easy to install and implement solution. You can see it on Github, but we'll quickly go through it here. Even though, we're using npx here, which is an npm function, it will see that we're using yarn and ask if we want to install packages that way, to which you should probably say yes. Now, we'll create a .eslintrc file inside our project. Now, we can close out our text editor, and reopen it and you should start seeing errors in files, like pages/index.js. If you're using VSCode, and have everything set up, if you hit CMND + S to save the file, it should lint the file and clean it up for us. Now, if you run yarn lint:fix in your terminal, it should go through the folder and lint and fix anything it can. If you get stuck at any point, Wes came out with an awesome Youtube video setting up the config for VSCode. Most applications will have environment variables specific to those applications as well as specific to environments. For example, in development, you might want to use one API endpoint, and in production, a different one. For that, I find dotenv is fairly easy to set up and manage rather than passing the variables directly to the start scripts. Now, we'll create a .env file in the root of our project and set the API endpoint for GraphQL there. Lets go over to init-apollo.js and set it as an environment variable. Lets start the app up and see if it still works... And sure it does! Real quick, I want to touch on deploying the application. For that, I will be using Now. And now, we just add a script to package.json to deploy our application. Thanks for following along, thanks for your time. As always, you cana find me on Twitter. I am going to conciously try to write once a week, so if you're interested in what I write about, feel free to sign up for the newsletter, I will never spam or annoy you, just try to provide as much value as I can ❤️.